A review of my experience earning my B.S. in Business Management from Western Governors University (WGU) – Welcome to wdw.org, the personal web site of W. David Winslow! For most of my life, I have gone through what I can only describe as “seasons of interest” in a variety of topics. My parents, my brother and my wife can actually list many of these seasons if you ask them. It is just part of who I am. Periodically, I’ll get very interested in a particular topic. I’ll stay interested for a period of time ranging from a few months to a few years. While I am focused on this topic, I tend to learn all I can about it. After I have learned all I’m interested in learning about a topic, I tend to move on to a new one. This has served me well in my Information Technology (I.T.) career because in I.T. technology is constantly changing, and you need to enjoy learning just to keep up. In the spring of 2012, the idea of going back to college and earning a degree started to interest me. Sixteen years earlier, I made the decision to quit college to focus all of my time on a web hosting company I had started back in the early days of the internet with a friend. That ultimately transitioned into a great career in I.T. and I simply never made it back to school. I don’t regret this one bit. Thankfully, by the spring of 2012 when I began to think seriously about going back to school to earn a degree, there were a tremendous number of non-traditional options for college available. I investigated a lot of the offerings that were available at the time. What I quickly learned was that there were a lot of online degree programs that were far less than ideal. Honestly, some of them border on being outright scams. Many online schools are not regionally accredited. Unaccredited schools might indeed offer a great education, however some organizations will not recognize a degree from these institutions as being valid. So, attending a regionally accredited school quickly became a top priority for me. After all, if I was going to put in the effort, I wanted a degree that was backed by the credibility of it being earned from a regionally accredited university. Once I crossed all of the unaccredited schools off of my list, I began to focus on other two other key factors. Key factor #1 for me was looking for a program that would truly be self-paced. Since I own and run a business, I have periods of time where I work 60+ hour work weeks and I simply don’t have much time for anything else. Other times, I might have a slower week, where I would be able to dedicate a larger than normal portion of my time to school work. So, finding a truly self-paced program was key for me. Factor #2 for me was cost. Somehow in this crazy world we live in, we as a society have accepted the idea that borrowing an enormous amount of money to go to college is simply normal and ok. I suppose if you earn a degree that leads to a tremendous salary the math might work out doing this. However, if you go to a high priced school and accrue tens of thousands of dollars in student loan debt, and come out earning a very small amount of money, your future is going to be financially difficult. As a small business person, I know that cost matters. So, while cost was not my primary consideration, it certainly was a key consideration. Ultimately, I wanted to try to go to a college that I could pay for out of pocket as I went. After all, I was going to be a Business Management major. A good business person should always be looking for a good value – right? I will not get into all of the details of my search, but I will say that it quickly became clear that Western Governors University (WGU) was the perfect fit for my education needs. They are fully accredited, fully self-paced and very affordable. In addition to being accredited, self-paced, and affordable WGU uses a “competency-based model”. This model seeks to measure your competency in an area, rather than a more traditional model that measures how much time you spent learning about a topic. Here is a simple example of this. If you as a WGU student have a math class you need to take, and you can prove you are competent in the subject material covered by the class by passing a proctored exam, or producing a work product of some kind (paper / presentation / spreadsheet etc) WGU will let you take the exam or produce the work product, pass that class, and move on. WGU could not care less if it takes you three hours, or three months to learn the material. They are measuring your competence, not how long it took you to become competent. This competency based model sealed the deal for me. I am a very goal oriented and task focused person. I like being told what the goal is, then being turned loose to accomplish it. So, the WGU model was a perfect fit for me. In very early May of 2012 I called in and spoke to a WGU Enrollment Counselor by the name of Michael. Over the next few weeks Michael helped me through the WGU application and acceptance process. WGU starts a new term at the beginning of each calendar month. Terms are six months long. I was targeting a June 1st start date. I admit, once I get interested in something, I can be a bit impatient. I took and passed an entrance exam which focused heavily on math and writing. I also got my high school and college transcripts sent directly to WGU, and I completed a few other tasks to keep the process moving along. In the end, I had only one college class that transferred. I opted to work towards a B.S. in Business Management. While I did consider several of the I.T. majors which would have leveraged my I.T. knowledge, I was more interested in filling out my business experience with some formal business education. After a couple of weeks I was accepted and approved to start on June 1st. Michael was a huge help, and I am very thankful for all of his help. Michael soon passed me off to my “Student Mentor” named Nick. At the time, I did not understand how valuable Nick’s help was going to be to me. WGU uses a mentoring model where every student has a “Student Mentor”, and every class has one or more “Course Mentors”. After experiencing it first hand, I can say with confidence that this is a great model. The Student Mentor essentially serves as a single point of contact with the university. Whenever I had any sort of issue related to my WGU education that I could not figure out how to deal with on my own, I would simply get in touch with Nick and he would get me pointed in the right direction. Nick and I setup a weekly call schedule. Even though our calls were short (probably never more than 15 minutes) they proved to be invaluable. During each call Nick and I would talk about where I stood and what I needed to focus on next. He optimized my time by making sure I took courses in the most efficient order. When I was busy with work and unable to dedicate much time to school, my weekly calls with Nick served as a reminder to keep my WGU work a priority. I credit Nick with keeping me on track and out of trouble while I was a WGU student. As I mentioned earlier, each course has one or more Course Mentors who are essentially subject matter experts in the area covered by the particular course. I honestly only reached out to a course mentor for “live” help two times. Once, this was in an online live webinar, and the other time was an individual appointment. However, I made extensive use of the material that the course mentors published in the WGU Communities (private WGU student forums). Many times these materials would include videos or guides to focus your learning. These resources were invaluable. If you are a self-motivated person who learns well on your own, WGU provides all of the materials you will need. WGU suggests that students spend 15 – 20 hours per week on school work. This seems like a great general guideline, but because of my work situation the reality for me was that some weeks I spent 40+ hours on school, and at other times I went several weeks having spent nearly no time on school at all. While my guess is this is not at all typical, because WGU is truly self-paced, this worked out ok for me. Before I started at WGU, Holly (my wife) and I had prepared ourselves for several years where our family time would be limited. Let’s face it, that 15-20 hours per week has to come from somewhere. My expectation was that I would complete the WGU B.S. in Business Management in about four years. The average WGU student completes a WGU degree in about two years. However, that average student might have considerable transfer credit from previous college courses or might have just been laid off and have unlimited time to focus on school. So, I expected that in my case it was going to take me longer than normal. Thankfully, I was wrong. One of the first calls Nick (my Student Mentor) and I had was a call to determine what classes I was going to take during my first term. Maintaining satisfactory academic progress is very important at WGU. I honestly did not understand all of this at first. Nick really helped keep me on track, and out of trouble in this area. So, Nick helped me pick the first few classes that I would commit to take during my first term. Once those were chosen they became active, and I started to work. One of the things I learned to love about the WGU experience is the “My Degree Plan” tab in the WGU student portal. That tab shows every class you need to take and pass in order to earn your degree. For me, this just became a massive to-do list. I LOVE to-do lists. Essentially WGU classes measure competency in one of two ways. This is done either by “objective assessments” (think: proctored exam) or a “performance assessments“(think: writing papers / creating presentations / producing videos etc). Classes that have objective assessments also have a pre-assessment (think: practice test) that lets WGU know if you are ready to take the real assessment or not. If you pass the pre-assessment with a score 10 points higher than the cut score for the real assessment, WGU will let you take the assessment, prove you are competent in the subject matter and move on. So, at Nick’s suggestion I started taking pre-assessments like crazy to see where I stood on many of these courses. It turns out, that over the years I had learned a lot about many of these topics while working in the business world. I actually passed all of the pre-assessments the first time I took them. Unfortunately, I did not pass all of them with high enough scores to take the real assessments. So, I quickly settled in and began focusing on attacking these objective assessments. In my view, these were the “low hanging fruit”. Often, I would study a topic well enough to pass the pre-assessment with a high enough score to take the exam, and then I would ask Nick to approve me taking the exam. He always did this quickly. For the first couple of months I was knocking out objective assessments left and right. The objective assessments are given using an online test delivery tool, and proctored electronically by a person who watches you through a special web cam that WGU provides to prevent cheating. Having someone watch you VIA a webcam is a bit strange at first. However, it is worth the convenience of being able to take these tests from home rather than going to a testing center. Early on, as I made progress with the objective assessments, it started to become clear that this was not going to take me four full years. While Nick heartily approved my taking and passing objective assessments he also encouraged me to get to work on some of the classes with performance assessments. No matter how well you know a subject these performance assessments take time. So, I started working on classes with performance assessments as well. I have always preferred taking tests to writing papers. It is not that I mind writing; it is that it simply takes me longer. For many classes with performance assessments you must complete multiple tasks. WGU uses a system called taskstream.com. Essentially, you complete the tasks that are specified and upload them to TaskStream where they are graded based on a rubric and sent back. I had a love / hate relationship with TaskStream. While, I can’t think of any better way to do it that would scale, the process can be a bit irritating. Essentially the graders are looking for lots of specific items in your work. If your work has all of those items covered well, your work will pass. If you don’t correctly cover even one item on the rubric, your paper will be sent back for a revision. In my case, I believe that roughly half of my work passed the first time, and the other half came back for what were usually minor revisions. This annoyed me a bit at first, but I decided to channel that annoyance. Each time a task came back for revision, I would revise it and resubmit it as quickly as possible. I know there were multiple times that I had revisions uploaded within one hour of the paper coming back. In my head I figured I was “sticking it to the man” by doing this. This is probably not a valid thought at all, but it helped me channel my aggression which was useful. After I completed all of the other classes, I began work on my Capstone project. As a business management major this is essentially a fully fleshed out business plan for a startup company. I really enjoyed doing this, and it was a perfect project to pull together and demonstrate all that I had learned. I probably invested about 30 – 40 hours total in this project. Thankfully, it passed with no revisions with a 3.9 the first time I submitted it. In the end, it took me just under ten months to complete all of the work required to earn my B.S. in Business Management from WGU. The value I got from this experience has been absolutely exceptional. If you are an adult considering going back to college to earn your degree, I would strongly urge you to consider WGU. Here are some specific resources I would suggest that you review if you are interested in doing this. For many people earning a degree would qualify them for a better job. In my case, it really does not. I love the work that I do, and I am well compensated for it. As I mentioned early on I tend to go through “seasons of interest”. A few of those topics over the years have “stuck”. By stuck, I mean that I have maintained an interest in the topic long term. One of those areas of interest that stuck a long time ago is I.T. security. WGU happens to have a M.S. in Information Security and Assurance. I already have a fair amount of background in this area, but the WGU masters program will certainly offer me the chance to learn even more. So, on June 1st, 2013 I start all over again with WGU as a student in the Information Security and Assurance program. This entry was posted in Education, I.T.. Bookmark the permalink. Thanks for the insight on your experience at WGU. As someone who plans to enroll at WGU sometime in 2014, I found your review to be very helpful! Congrats on a job well done, David! I look forward to hearing about their Masters program once you get started! Congratulations. I stumbled on your blog while searching for information on WGU. I too will start my 1st term this June, 2013, pursuing the same BS in Business Management like yours. Your journey is very inspiring but I am worried about my journey. Hope I will do as well as you and accomplish my degree in a possibly short period of time. Best of luck with your graduate studies. I will carry your WGU success story with me as my inspiration source for my studies with WGU. @ Jason – Thanks man! @ Daniel – That sounds great! Don’t worry at all. I am sure you will do great! Best of luck to you! You story sounds familiar. It was a good read and provides motivation if I want to proceed. GREAT BLOG!! I am so intrigued by WGU’s class structure and the ability to save so much money! I’m currently a auditor for the government (CMS) and although I’ve been fortunate to work my way up the corporate ladder. I still feel I have a greater earning potential because a degree is pretty much a standard in my industry. My son is now 10 years old and I am really looking for a program that will allow me to complete my degree in a short period of time, while providing me with flexibility. Some of the costs associated with going to college are kind of scary because who wants to graduate and have a $1500 per month debt for the next several years?? NOT ME! I think I might have stumbled upon a gold mine with this degree program! Thanks for taking the time to blog and congratulations on your accomplishment. BTW, you’re not a gemini are you?LOL. Fantastic and totally thorough review of your first run at WGU. I like many of the other responses am thinking about enrolling in the school. My life mirrors yours quite a lot. Tons of “seasons of interest” on tons of topics of interest with only IT being the one that stuck. My end result in IT might be slightly different (for now) but this really sounds like the perfect school for me. For a laugh the website below is one of my “seasons of interest” or as I call it IGNITION FAILURES…. Network security is one of my IT goals but good WEB DESIGN and DATABASE management are others. Too bad WGU does not have a good DESIGN degree. Much of that is subjective and does not fall easily into objective based learning. Great article. You stated that you completed in 10 months. That is pretty impressive. Did you transfer in credits? You mentioned that you dropped out of college 16 years earlier. Where any of those credits re validated? As other have, I’ve stumbled across this blog while researching WGU and I must say that your story has pretty much confirmed that I made the right selection in choosing WGU to obtain my BS in Business Management. Much like you I plan to commit pretty heavily to finishing quickly and I had originally planned on finishing in 2 years. The fact that you did it in 10 months now gives something to shoot for. 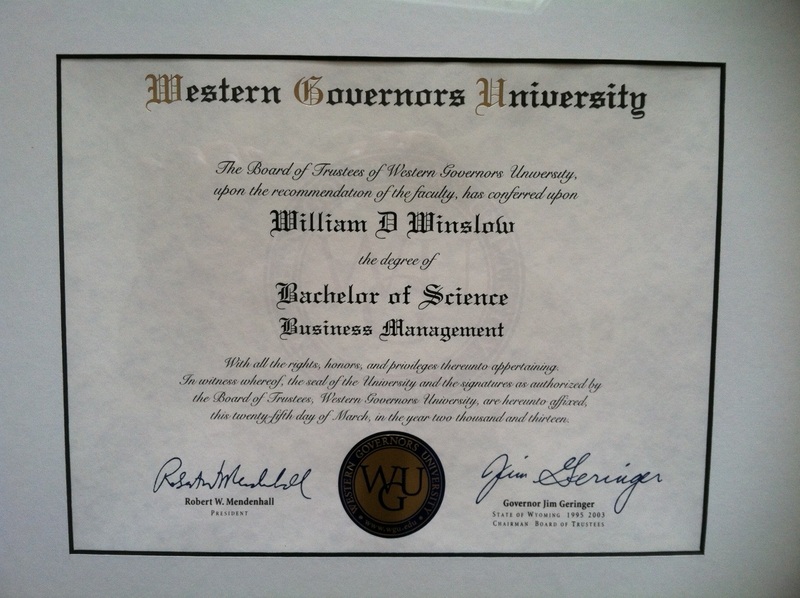 I also plan to follow up with my MBA from WGU after completion of the bachelor’s degree. I did have one class from my previous college work that transferred in and allowed me to skip one of the science classes. I’m starting WGU on March 1, 2014. I was looking for stories like this. Thank you for posting. Congrats! This was such a great review of this University! I have been thinking of completing my bachelors degree here after receiving my associates degree this summer. It seems to be the best fit for me, as I am starting a new job here soon in my field of study. I feel that this bachelors degree in Business Management will help me climb the ladder faster. I wish you the best of luck with your masters degree and you have inspired me to go ahead and apply! I am starting at WGU on May 1st, 2014. I did my research before choosing WGU, but I still was nervous about returning to school. After reading your article, I now know more of what to expect and feel much more comfortable about my decision. I too am going into the Business Management program and am excited to start. Thank you so much for writing this. I just applied today. Your blog helped because it reminds me of myself. I tend to get distracted (Hey look, something shiny) too. I hope to pass my admissions assessment and then I plan on 3 year and hope I am right. Thanks again. Phenomenal job! I started WGU May 1st – Business Management major – and your detailed account makes me even more excited. I am a “to do” list person as well so I giggled when I read that you love to do lists also! That is how I see my course plan. Good luck on your future endeavors and many thanks again for writing this detailed review! I’ve been considering registering with WGU for a couple of years. After reading about your experience with WGU, I’m convinced it’s the right college for me. Thanks for sharing your story. Interested to know how your MS degree work is coming along. Is it the same pace as your Bachelor degree? An MBA is what I want to work towards. Thanks again. Hi James – Actually, I have not yet started my MS-ISA at WGU yet. “Life happened” and I delayed starting the program. The timing of your comment is fantastic. I’ve had a couple of calls with WGU the last couple of days. Assuming I am accepted, I’m personally targeting a June 1st start date for this program. I’ll try to blog a bit more frequently (if possible) during the MS-ISA. Best of luck to you at WGU! thank you for writing this blog! I am planning on starting this fall to get my bachelors in business management. I have my associates in Business Administration and feel like this is the best fit for me. If you don’t mind me asking, how was the entrance exam? Is this proctored or just a test you take and submit? Thanks! Best of luck to you. Hi Erica – It is not proctored (if I remember correctly). It is an online test you take and submit. Good luck! Thank you for sharing your experience! I am a new student to WGU and stumbled across your blog. I found it very insightful and encouraging, as with undertaking any new endeavor I seem a little overwhelmed/confused at this point. Seasons of interest/ ADD also discibe myself to a tee. Thanks for taking the time to explain your process. Now I’m off to get those low hanging fruit. Hey David, great blog! I was wondering if you started the MS-ISA at WGU? I am considering taking it also and want to know how it is going for you? Hello! Thanks for the article! It was definitely a very informative read. I have been researching schools to enroll in to finish my bachelors degree when I move to Texas after completing my Associates here in Delaware. Of course, I researched “regular” schools also but WGU seems to be right up my alley. Thanks for the information! It always helps to get firsthand information from someone who has experience. Thank you for blogging about your WGU experience. Great recounting of your experience! Thanks for your insight on WGU and BSBM. I am currently in search of my Grad school. Due to my 3 year degree, I am looking to get done with BS and move on. Your blog is eye opener and ice breaker for my perplex. This was a very informative article. It really allowed me to erase a lot of the doubt I had about the University (all online programs really). Thank you very much! Thank you so very much for a very informative, sincere and well written post. It really spoke to me. This was an awesome overview of the “life” of a WGU learner. I have started at WGU 10/2014, transferring in a handful of credits from decades gone by, and the blessing of my husband to focus “only” on your education. I was a bit concerned that this might take several years. Although I have my spouses blessing, I did not want to unnecessarily spend more time than necessary getting this personal goal accomplished. With that said, in talking with my student mentor, and having my time to myself, I have successfully finished my first set of classes early (as a newbie, I was nervous about this new process), and am now looking to add on more classes before my 1st semester end. What a blessing WGU is. I now see my educational goal as a soon coming reality. Thank you again for this article. For almost 20 years I have been in IT, i’ve been a software developer, web designer, network admin, business analyst, DBA and in my most recent incarnation Project Manager. Im taking my bachelors of business with a concentration on project management, I started in January, went on 2 weeks vacation and as of today I have completed 25 credits, im striving for 40 credits this semester and my bachelors by june 2016. Thanks for your blog, it was my inspiration for starting school. Hi John – Sorry for the delay. I actually did enroll in that program, then I got too busy on other higher priority things and had to withdraw a couple of months in. To be totally honest, I should not have enrolled. We were in the middle of several big transitions (building a house / huge projects at work etc). My timing was a real mistake. So, I can’t say much about the program. Sorry man! Wow – thanks Miguel. That is very humbling. I am happy to have been able to help you in some small way. I wish you all the best at WGU. You have clearly gotten off to a great start! Thank you for this well-written and helpful blog post. I’m looking to redirect my career (from project management to human resources), and WGU seems like an excellent option. Reading your experience has helped strengthen my decision to pursue a degree there. Very helpful review. I’m currently evaluating WGU and found this very insightful. Thanks for taking the time to post! schools and this just cemented my decision. BTW How is your Master’s coming along? I am so happy that I have come across this blog post. I, like you, find myself interested in many different things. I come across something I like, learn everything I can about it, until the next thing comes along. I have been wanting to get a degree, and a career, for years. I have finally, at 40 years old, decided to do so, and have applied to WGU. I am (hopefully) enrolling in their BSIT – Security program. I will have little to no college credits transferred, am currently taking three courses this semester and a community college so I won’t be able to start until fall after I send my transcripts, and will be working on getting an IT certification in the meantime. Hopefully these things will get me accepted into the program. Can’t wait!! First of all, you remind me exactly of my boyfriend. Secondly, thank you for the great article. Although, I was pretty set on attending WGU for my B.S. in Business-Information Technology, now I can say I’m positive! What a great read. Thank you so much for this blog. I am a current WGU student, completing my first year, and planning to make the next two semesters (beginning Oct 1st), as my completion year. After walking away from attaining an undergraduate degree since 1985 (multiple times over the years), let me say, you nailed it in describing the value, context of learning, and the great unheard of journey that WGU offers its students. I have not stopped learning and aspiring yet. The method of learning and acquiring so inspires me on this journey. It is so rewarding, that I to will be taking on one of their masters program (MBA-Health Administration), as soon as I complete the undergraduate season of my life. Getting a great college education like this, never seemed doable. I am so grateful for the opportunity to learn, to now be regarded as an expert in my field (on hands and learning), and to just say, I did it! Again, a great read alum. This blog surely inspired me, a new student at WGU, who like you am a “seasons of interest” learner. I had a 20 year gap between my first stab at college and enrolling at WGU for some of the very same reasons you did – regional accreditation, flexible schedule for a single self-employed mom, and ability to keep student loan balances low. Every line you wrote is an accurate assessment of the WGU experience from the enrollment counselor experience to your assigned mentor and testing. I have been enrolled 2 months now and with 18 transferred hours feel confident that I can obtain my B.S. Business Management – IT Management degree in alot less time than my degree plan states thanks to your blog. Thanks for sharing your story and motivating a girl from Louisiana to stay focused and finish strong and fast! I wish you all the best! This was a great read. I appreciate the detailed description of your experience with WGU. I’m looking to get my B.S in Business Management as well. I’ve been a retail manager for years and I’d really like to focus on my studies to get our of retail. Congrats on finishing so quick, I’m hoping to be done in two years…. fingers crossed! Good luck on your next adventure! I was skeptical about WGU but reading your blog on your experience really solidifies me going there I’m a task oriented person as well you give me a list and i’ll be able to take care of it within the year. I’m hoping to go to the school for accounting and I believe it will be the best fit for me as i am really great with numbers so thank you for your post it really encourages myself to take the step! I know this is from a few years ago but did I read this correctly? You only had one class that transferred in and you finished a BS degree in 10 months? WOW! Really impressive. You have made my decision easy, I am going to apply to WGU! Thanks! I start on April 1 and your story has made me even MORE excited about doing so!! Thanks for taking the time to share this. Hey David, thanks for sharing your story. You mentioned it took you only 10 months to finish. Did you transfer any credits, or did you finish the degree from start to finish in 10 months? Also, now that you’ve started taking IT courses at WGU, how would you compare the difficulty between the IT/business units? You are very welcome! I was able to transfer in some credits that let me not need to take one of the science classes. I actually ended up pulling out of the WGU Masters program a month or so end. No issue on WGUs end – just life stuff on my end. Thank you David I enrolled to begin Sept 1st. I’ve had my Associates degree in Fashion Merchandising with a ton of Marketing credits (1 year at University, 3 years at a Community College), owned three businesses, survived cancer and really want my business degree now at the ripe old age of 50 something….Your blog and other’s comments give me hope that I can do this even though I’m employed full-time now. I’m excited! My transcripts transferred over 39% of my credits. There’s a big list of classes to master, but I’m like you. I love lists! I really appreciate you shooting from the hip on this one. I enrolled in Capella University and found out that they have some Department of Education issues going on. I found this very informational and I am happy that I started my application process with WGU. Your article has me fired up about obtaining my MBA. Thank you again, you do not know the stress I was under for the last 2 weeks. Thank you again Mr. Winslow. Good luck Sue! I bet you will do great! Working on my capstone and came back across your site that helped me decide on WGU, quite the full circle! Wow – that is awesome! Finish strong! Enjoyed this post. I start WGU on 7/1 and I’m scouring the internet for blogs about people’s experiences. I hope I’m able to finish quickly like you! Thanks for sharing your experience. Hi Stephen – My WGU contact had heard of a couple of people doing it. So, I suppose that it is possible. However, it would require an amazing amount of focus, effort, and ability.